One and two day Elephant Adventure and Jungle trekking tours within the Mondulkiri Project give you the opportunity to experience a beautiful jungle a short drive away from Sen Monorom. Wild rivers, waterfalls, swimming holes, elephants, wild animals and birds are all waiting for you. On our tours you will get to feed 5 elephants and follow them as they walk through the forest eating bamboo. A highlight of your tour will be swimming at a waterfall and helping to wash our elephants there. 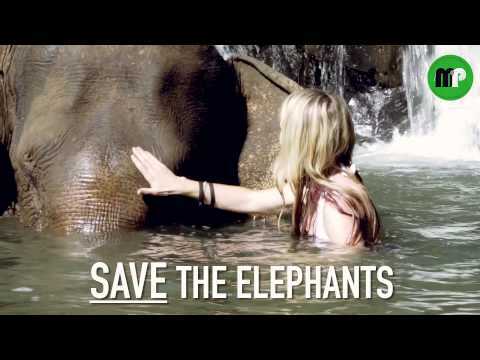 We do not allow tourists or our mahouts to ride the elephants or sit on them when they are being washed. The 5 elephants at our Sanctuary spend all their time in our protected forest. They will never again have tourists riding on seats on their backs or be used for heavy farm work. Some locals offer cheaper tours but only rent elephants on the days when there are customers. Unfortunately these elephants are also still used for elephant rides. Our elephant tours are lead by an english speaking guide who has extensive knowledge about the elephants you will see and the traditions and customs of the hill tribe people who live within the forests. We only employ Bunong guides for our overnight jungle tours. They are experts at living in the jungle. You will need to be in Sen Monorom the night before your visit date as we meet in town at 8.20am. Our tours finish around 4.30pm. June, July, August and September is wet season in Cambodia. Sometimes it rains only in the afternoon. Sometimes it rains all day. The walk down into the jungle to meet the elephants is wet and slippery. If you do not have good balance or fall over easily it is not a good time of year to visit us. The mud also makes our jungle trek on the two day tour more difficult. Pick up from Sen Monorom, with transport to and from the Mondulkiri Project’s elephant sanctuary. Hand feeding and observing 5 elephants as they walk through the jungle. Waterfall swimming and washing of elephants. Pick up from Sen Monorom with transport to and from the Mondulkiri Project’s elephant sanctuary. Day 1 Elephant Adventure Tour as above. Traditional hill tribe meals and the opportunity to try rice wine around the Jungle Lodge campfire. PLEASE NOTE: Our two day tour is sometimes done in reverse, with the jungle trek on day 1 and the Elephant Adventure Tour on day 2.